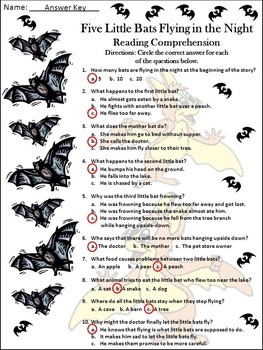 Halloween Reading Activities: Five Little Bats Flying in the Night Halloween Activities Packet Black & White Version:This cross-curricular activity packet is full of engaging activities which can be used to complement the children's book, Five Little Bats Flying in the Night, by Steve Metzger. 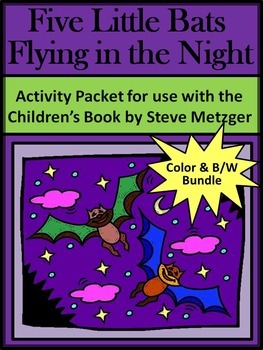 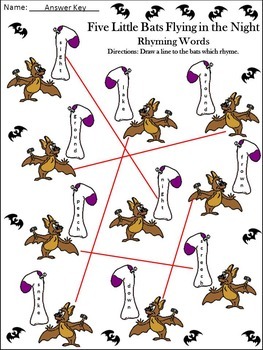 This cross-curricular activity packet is full of engaging activities which can be used to complement the children's book, Five Little Bats Flying in the Night, by Steve Metzger. 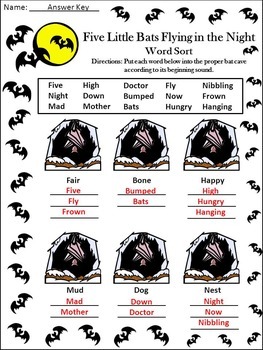 Includes a reading comprehension quiz, a vocabulary worksheet, a rhyming words worksheet, a phonics word sort, an alliteration worksheet, a worksheet on recognizing differences, a math worksheet on counting by 5's, three math addition worksheets, three math multiplication worksheets for 5 family of facts, and answer keys for all Halloween worksheets.